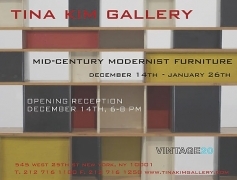 Tina Kim Gallery is pleased to announce, Mid-Century Modernist Furniture, the premier exhibition of mid-century design held at the gallery's new space in the Chelsea Arts Tower. 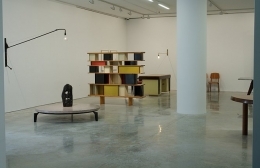 Curated by Jaewoong Chung of Vintage20, a Manhattan based firm specializing in European mid-century furniture and decorative art, the exhibition will feature rare and important works created during the middle of the 20th century by influential architects and designers. 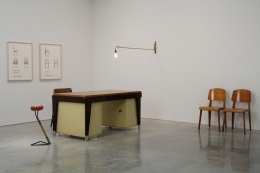 Among the objects on view will be a director's desk by Jean Prouvé, with a matching director's chair, both circa 1950. The pieces, made from bent steel and wood, have clean lines that fluidly combine form with functionality. 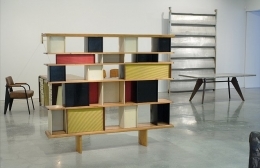 Other notable pieces on display by Prouvé include a beautiful "Mexique Bookcase" designed for the Bibliothèque pour la Maison de Mexique made in collaboration with Charlotte Perriand for the Cité Universitaire de Paris, as well as a rare and important "Tropical Congo Table (c. 1950) and low table (c. 1950)." 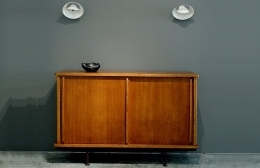 Also on view will be a Pierre Jeanneret sideboard (c. 1950) a free form table and daybed by Charlotte Perriand (c. 1950), and light fixtures by Jean Prouvé and Serge Mouille. The elegant design of Jeanneret's cabinet subtly references the work of Art Deco designers of Émile-Jacques Ruhlmann and Jules Leleu, while its streamlined forms fuse to create an entirely new style. 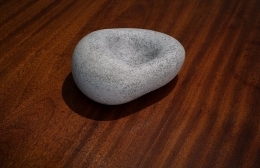 Perriand's pieces are equally evocative. The daybed, upholstered with fabric, is noted for its simplicity and functionality. 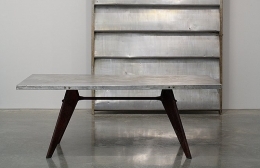 Moreover, Perriand's free-form table is one of the most iconic designs in modernist furniture. In a nod to ergonomics, the designer meticulously created the table with splayed legs, so that people sitting on the ends could stretch their legs comfortably. Jean Prouvé (1901-1984) ranks amongst the most innovative engineers and designers of the 20th century. 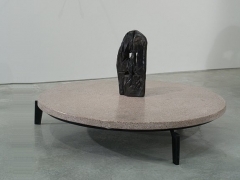 He began his career as a metal craftsman in Paris, and opened his own smithy in Nancy in 1923 where he produced his first furniture made of thin sheets of folded steel. In the early 1930s, he created what are considered his most famous pieces: the standard chair that led to huge furniture commissions from hospitals, schools and other institutions. 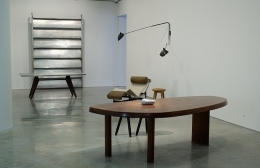 The Second World War would change Prouvé's furniture, most obviously in the materials he used. With metal scarce, he turned to wood and later, aluminum. 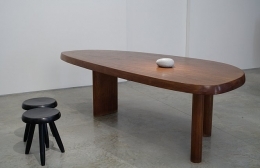 His work is renowned for its marriage of form and functionality, craftsmanship and industrial materials. 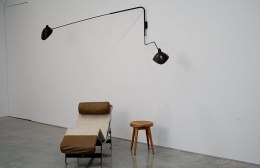 Charlotte Perriand (1903-1999) was a pioneer of modern furniture design. From 1927 – 37, she worked with Le Corbusier and Pierre Jeanneret to develop their systematized furnishings known as "machines for living". Although best remembered for her elegant modernist tubular steel furniture of the 1920's and 1930's, she also produced craft-based designs, such as the Synthese des Arts chair (1955). She is renowned for many interiors such as the Air France offices in London (1957) and Tokyo (1957) and the United Nations conference rooms in Geneva (1960), as well as the collaborations she did with Jean Prouvé. 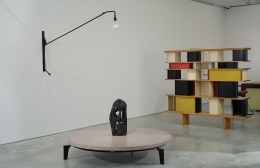 Serge Mouille (1922 – 1988) is widely celebrated for his spindly black lighting fixtures that he designed in the 1950s such as 1953 Oeil, 1954 Flammes and 1958 Saturn. 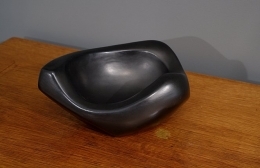 In 1952, he became director of the silversmith department at the School of Applied Arts in Paris. Soon after, he was commissioned by Jacques Adnet to develop lighting designs in reaction to the too complicated Italian designs that flooded the 1950's market. Mouille made each of his lamps by hand, and never used machine technology to maximize production. Pierre Jeanneret (1896-1967) was an architect and designer best known for the work he did in collaboration with his cousin, Le Corbusier. In 1926 they published their manifesto "Five Points Towards a New Architecture" which laid out the principles best exemplified in their renowned building, the Villa Savoye (1928-31). In the 1950's he and Le Corbusier were invited by the Punjabi government to apply their city-planning principles to the design of low-cost governmental buildings for the city of Chandigarh.